Rise import single also available, with bonus track "Libertine"
How eagerly awaited was this album?! Finally released, the first single "Rise" received some airplay and MTV even ran some late-night ad spots. Long-time fans were finally rewarded and new fans were surely made. 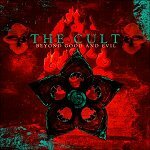 Unfortunately, the band has since severed its ties with Atlantic Records so there won't be a follow-up on that label, but perhaps the Cult will rise again on another, as they have before. "Old fans may have trouble adjusting to the Cult's updated sound, but the band manages to maintain the energy of their music, creating heavy metal for the new millennium without lapsing into the pure cliché that waylays so many angry young (and old) men."